The North-East India tourism boasts of places of beauty where nature flourishes with all its glory. Situated amidst the many hilltops, the scenic valleys and the beautiful places to visit in North East India paint a picture that you need to see to believe. Welcome on arrival at Guwahati Airport / Railway station. Transfer to Bhalukpong, , a town on the Assam – Arunachal Pradesh border & overnight stay. Morning drive back to Bomdila. 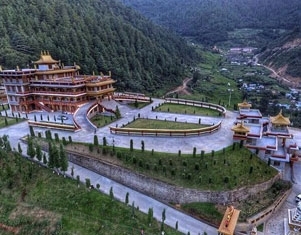 At a height of 8OOO ft., Bomdila is a small town famous for its Buddhists monasteries, magnificent valleys and Himalayan landscapes. Evening free at leisure.Overnight in Bomdila. After breakfast drive to Guwahati. Check in Hotel. Overnight in Guwahati. Morning visit Kamakhya temple (if time permits).In time transfer to Guwahati airport for onward journey. TOUR ENDS HERE. Situated on top of the Nilachal Hill, Maa Kamakhya Temple is the most sacred among the tantrik shrines of Shakti worship in the world. Kamakhya temple is also famed for the annual AmbubachiMela held for 4 days during monsoon season. There are images of Lord Ganesha, Goddess Chamundi and many dance fixtures. Situated on the Nilachal Hill, the temple structure resembles a Shikhara - a beehive. Besides the main Devi temple, there are temples of 10 Mahavidyas in and around temple. These include Bhuvaneshvari, Bagalamukhi, Chinnamasta,TripuraSundari, Tara, Kali, Bhairavi, Dhumavati, Matangi and Kamala Temples. Temple doors remain open for devotees in the following timings - 08:00 am to 01:00 pm & 3:00 pm to 5:00 pm.